For a couple of weeks mid-September 2004, type rose to the surface of public consciousness when there was intense debate over the authenticity of memos that discredited President Bush’s Vietnam-era service in the Texas Air National Guard. CBS News released the memos on 60 Minutes, but was soon forced to investigate their origins more closely. As people began to ask questions such as, ‘Was Times Roman widely available in 1977?’ and, ‘Were you able to do proportional letter spacing and superscript ‘th’s’ with office equipment of that time?’, it became clear that the star witness of the case was typography. News programmes needing commentary on the topic turned to type designers Jonathan Hoefler and Tobias Frere-Jones – or the ‘forensic typographers’, as they were referred to during this period. Jonathan was invited on to National Public Radio to explain the role of typography in forensic document examination. His interviewer seemed more intrigued by the fact that someone’s profession could be making fonts. If he’d read the New York Times a few weeks before, however, he’d have encountered a feature in the Metro section devoted to a single typeface. Gotham, designed by Tobias and originally commissioned by GQ magazine, was the typeface chosen for inscription into the twenty-ton slab of granite in the cornerstone of the Freedom Tower, the building currently being erected upon the site of the World Trade Center. The choice of Gotham for such a prominent building has shot the typeface to an unprecedented level of fame. It also represents the neat completion of a circle, because Gotham was inspired by the lettering found on utilitarian buildings in New York; here it is refreshed and recontextualised on the city’s most blatant symbol of civic pride. The germ of the typeface was the sign that read ‘Port Authority Bus Terminal’, and in order to find some ancillary sources that would help fill out the character set, Tobias focused on the fronts of office buildings in mid-town. ‘In that process I started noticing some other stuff on the street which, while it didn’t relate to Gotham at all, was worth taking pictures of.’ The ‘stuff’ he began photographing was what he calls ‘non-typographic lettering’ (he avoids using ‘vernacular’, a term he finds annoying) and which includes hand-painted, gilt and engraved letterforms. To keep track of his progress he has created his own map of the city made from satellite photos. His collection of photographs of signage lettering from the streets of New York currently numbers about 4000. Between them Jonathan and Tobias have designed some very visible typefaces that have had lasting cultural impact. In 1994 Tobias designed Interstate, based on the lettering used on us highway signs; and Hoefler’s eponymous text family has been a default on the Apple computer operating system since System 7 was launched. Jonathan is a mostly self-taught designer. He established his own foundry at the age of eighteen, having spent just a year working with the magazine and newspaper art director Roger Black. It was Black who was responsible for introducing Jonathan to type specimens, which he has been collecting and studying ever since. Tobias’s design education was more conventional. He studied graphic design at The Rhode Island School of Design, during which time he had his first typeface, Dolores, published by Font Shop. 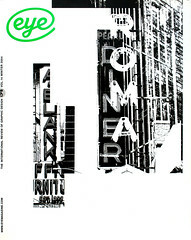 He was a senior designer at Font Bureau in Boston for seven years before joining Jonathan in New York in 1999. In 2004 they formalised their working relationship and Tobias became a principal at the foundry. In 1988 the eighteen-year old Jonathan wrote a spirited letter to the satirical Spy magazine pointing out an inconsistency he had noted between the magazine’s critique of postmodern typography – as found in the company spelling of Filofax – and the magazine’s own idiosyncratic typography cultivated by art director Alex Isley. Meanwhile Tobias, was growing up in Brooklyn in a scholarly household (his brother Sasha would go on to be a music critic and his father unwound at weekends by writing operas about the fall of the House of Hapsburg.) At the age of sixteen he won a type competition with a typeface he composed with a rapidograph and drawing board. One of the defining factors of a typeface designed by the duo is the rigour of their research and development process. In the preparation of a typeface called Retina, ‘designed to live in a hermetic 5pt universe,’ on the Wall Street Journal stock pages, Jonathan and Tobias analysed 129 domestic and international newspapers. They show me a gigantic binder file that contains 3800 unique examples of ways in which news agate is used. Armed with this information they were able to test the efficiency of the typeface in every possible context – from fish counts to rodeo scores to grain prices to double acrostics in ten languages. They also tested the typeface on press to make sure that their solution, with its enlarged counters and ‘traps’ to collect pooling ink at the intersection of strokes, really could stand up to the effects of spread and ink squeeze that occur in newspaper printing. ‘We’re also just kind of nerdy about doing research,’ observes Tobias. Then there are the kerning pairs. Tobias has developed a new process for proofing them, and as he leafs through a stack of print-outs that contain tens of thousands of kerning pairs for the typeface he is currently developing, he can barely suppress his glee. ‘Looking at the capitals meeting up, there are 676 possible combinations,’ he explains. ‘The traditional sequence I had been taught was aa, ab, ac, ad, and so on. I realised it was more effective to ignore that alphabetical linear sequence, and to look at them based on their visual proximity, such as cge.’ All well and good so long as you are using a Latin-based language. But when applied to Cyrillic languages, for example, the logic falls apart. So Jonathan stepped in, took Tobias’s methodology, distilled it down to core lessons, and ‘built a tool that enables you to tell a typeface this character has these qualities and so it spits out a new proof with all the possibilities.’ To make the tool he used a programming language called Python, invented by Dutch software designer Guido van Rossum. It was included with RoboFog, the development platform released by his brother Just van Rossum and Erik van Blokland, with the result that the people who know Python now include not only rocket scientists and system analysts, but type designers, too. Tobias wanted to refine the process still further by presenting the pairings in realistic contexts – in words. ‘So I put together a list of words so that for every possible letter combination there is a word that contains it somewhere in the middle of it.’ He recalls with relish how he found bizarre combinations, such as a ‘jz’ in Dutch and a ‘jx’ in Chinese. When he was testing Requiem, one of Jonathan’s typefaces that features decorative ligatures, he found that it was possible to have a ligature of the letters ‘stfj.’ Finding a word that contained this combination nearly stumped him until he happened upon an article about ships encountering difficulty from the Maelstrom in West Norway that mentioned a place called Westfjorden. The Texas Monthly commission also exemplifies the iterative nature of the process of developing a custom font with an art director. Dadich needed a typeface that would help distinguish the editorial pages from the encroaching advertising pages. ‘The editorial pages had to function as a solid stable platform, and I wanted to signal their identity purely through a typeface,’ he says. Dadich left his fingerprints on another typeface too. When he first saw Retina, he fell in love – ‘those inkwells, those amazing sharp angles.’ As a kind of a joke at first he tried it out really large and was delighted to see it had an interesting interplay with Sentinel. ‘Everything is so well crafted and finessed with an H&FJ typeface, that you can actually do something like take a typeface intended for 5pt stock listings and blow it up on the cover of a magazine. I do think I surprised Jonathan with this particular usage, though,’ says Dadich. Jonathan: ‘I would say it’s with Surveyor. We had the twin goals of making a typeface that felt very handmade, to evoke the craft philosophy of the magazine, and that could handle all of the charts, tables, recipes, graphs, almanacs and step-by-step instructions that they run in the magazine. We had been waiting to do a typeface based on the distinct style of lettering you find on engraved maps.’ He pulls out some maps to show me. Jonathan and Tobias are often called in to a project when a font needs to be constructed from a few elements. When Bierut was designing wayfinding signage for the renovation of Lever House in 2000, it was the ‘palaeontological’ aspects of the duo’s expertise that he sought. Bierut identified the original 1952 sign for the building as a point of departure. Type design does not appear to be naturally a team sport. How is the labour divided between the two designers? ‘When we worked on Lever House, I did the numbers, you did the letters, right?’ says Jonathan. ‘It’s a very strange faultline, though.’ ‘We take turns over who has the micro and macro perspective on a project,’ says Tobias. While editorial will always be at the core of H&FJ’s business, the designers relish the idea of commissions that are both more rarefied and more diverse: newspaper weather icons and chessmen, bitmapped fonts for mobile phones, embroidered garment tags, skywriting . . .
And the duo’s role as national typographic advisers? This still seems some way off. Despite the prominence of type in the debate over the validity of documents that suggested lapses in the President’s military record, and despite the designers’ sensible insights as recorded on blogs and in the national media, in the end, CBS news admitted that the memos could not be authenticated. Had CBS undertaken a thorough typographic examination of the documents, however, instead of putting emphasis on the results of outmoded handwriting analysis, they might have produced more conclusive evidence. In the mean time, Jonathan and Tobias will be waiting patiently.